This is the short we made for your longest ride. That ride where you’re demanding something extra from your legs, from your mind, and from your equipment. We’ve all done those rides when you use every last bit of energy, draw on all those training rides, and appreciate that extra bit of support and protection. Most Castelli products are made for racing and tend towards minimalism. This short goes the other way giving a bit more compression in the legs, an extra compression band around the lower back, and comes up a bit higher in front to hold everything in. We still couldn’t resist some nods towards minimalism, like the innovative leg ending that avoids any sort of elastic whatsoever and instead uses vertical bands that grip the leg with out limiting stretch. And the bib straps are completely seamless and just disappear when you put them on. And finally there’s the Progetto X² Air seat pad that straddles the line between giving plenty of support and padding while being soft enough that you almost don’t feel it. Absolutely perfect It’s way above any bib shorts I ever road with. Perfect fit and very comfortable. Firstly, the grippers are a work of art, truly unique and nothing like anything I've had before. Worth every cent without a doubt. I get you might shy away because of the price, but as the saying goes 'quality is remembered well after cost is forgotten'. 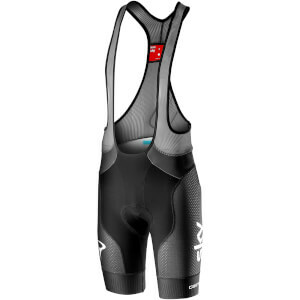 Don't go up a size with these either, I usually get XL in castelli bibs, but with these L is perfetto. And the materials chosen are amazing, you can really tell castelli have put deep thought into the design too. Okay, if you've read this far you know by now I'm a huge fan. Enough said.